4 April 2018, at 12:00a.m. Dr Lauren Edwards, the Animal Welfare Science Centre, discusses how the early-rearing environment of piglets can drastically affect their behavioural development, cognitive flexibility, social skills and stress regulation mechanisms. Several important biological systems are developing during the first weeks of a piglet’s life, and the early-rearing environment can have lasting effects on behavioural development, cognitive flexibility, social skills and the functioning of stress regulation mechanisms. These effects can have important consequences for pig welfare. For example, tail-biting, belly-nosing and increased aggression are all abnormal behaviours that can result from the conditions experienced in the early-rearing environment. 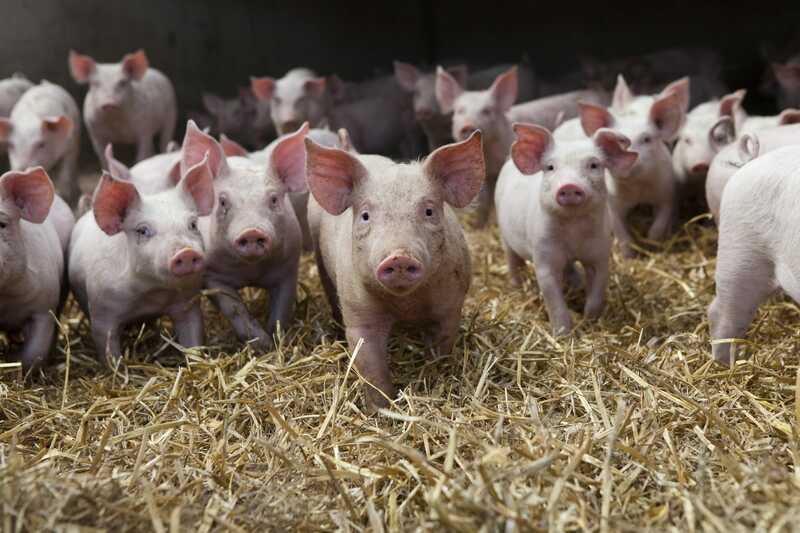 This article will discuss some of the long-term effects of the pre-weaning environment on pig behaviour and welfare in more detail. The early-rearing environment for commercial pigs differs substantially from that of their ancestors, the wild boar. Table 1 provides a summary of the differences between the early-rearing environment of wild boar piglets, and those of commercial piglets. Because the brain of domestic pigs is still remarkably similar to that of the wild boar, normal brain development occurs when piglets receive similar inputs to those that wild boar piglets receive. Housing piglets in a barren environment with limited social contact can lead to disruption of normal developmental processes. Table 1. Features of the early-rearing environment that differ between wild and intensive commercial systems. Piglets that are raised in a barren environment often display impaired cognitive functioning. This is because there are insufficient stimuli to allow full development of the neural connections within the brain. Impaired cognitive function has consequences for pig welfare as it is associated with increased fear of novelty. Piglets are learning important behaviours during their first few weeks of life, and providing enrichment in the early-rearing environment can have long-term effects on their behaviour. For example, providing enrichments that allow chewing and rooting behaviours can help to reduce tail-biting after weaning. This is because chewing and rooting are highly motivated behaviours in pigs, and if they are housed in a barren environment then they will redirect these behaviours toward their pen mates. The importance of maternal contact is also demonstrated by the effect of early weaning on belly-nosing behaviour. Piglets naturally direct their massaging and sucking behaviours toward the udder of the sow, and will redirect these behaviours toward their pen mates once the sow is removed. There is a direct relationship between the age of weaning and the degree of belly-nosing at several months of age. Aggression in adulthood is influenced by the pre-weaning social environment. Large litter sizes cause increased competition between litter-mates at the udder, and this is associated with increased aggression at the feed trough and during mixing at weaning. In addition, allowing litters to mix prior to weaning can reduce aggression by allowing piglets to learn appropriate social skills in a stable environment. Social skills are also enhanced by spacious and complex early-rearing environments that encourage play behaviour, such as play-fighting. Play-fighting helps piglets learn how to assess another piglet’s body weight and determine the outcome of a potential fight without actually having to fight. This means that during mixing they can quickly establish a stable hierarchy with low levels of aggression. In comparison, pigs raised in a barren environment will repeatedly resort to aggressive encounters to establish a hierarchy, which is why barren environments are associated with increased aggression. Social skills are also enhanced by spacious and complex early-rearing environments that encourage play behaviour, such as play-fighting. Normal development of the stress regulation system requires a period of relative freedom from stressors during the first weeks of a piglet’s life. Severe trauma or repeated stressors can permanently disrupt the normal development and functioning of this system, making the pigs less able to cope with stressful events later in life. Stressors during this period can include painful husbandry procedures, and weaning earlier than 4 weeks of age. The complexity of the early-rearing environment can also disrupt stress regulation, and pigs reared in barren environments can show higher basal stress levels as adults, and higher stress responses to handling. This has consequences for pig welfare, and potentially meat quality due to an increase in transport-related stress. The provision of sufficient space and enrichments that allow chewing and rooting behaviours. These enrichments can have numerous benefits, such as reduced development of tail-biting behaviour, improved ability to cope with stressors and novelty, and reduced aggression through the improvement in social skills. Allowing piglets to have unrestricted access to the sow, and delaying weaning for as long as possible to prevent the development of belly-nosing. Minimising the stress and pain that piglets experience early in life to ensure normal development of the stress response. Obviously, there are practical implications for the provision of enrichments, such as their cost and compatibility with the manure removal system. Some cheap options here are newspaper, and ropes or sacks suspended within easy reach of the pigs. It is important to note that any enrichments provided must be given in sufficient quantities so that piglets don’t have to compete with each other for access – competition for enrichment can result in stress and be detrimental to their development. It is hoped that future research will compare the immediate costs of enrichment against the longer-term benefits of improved carcass quality due to reduced aggression, tail-biting and stress. This article is a summary of the information provided in Telkänranta and Edwards (2018). For more information, please see the full article: Telkänranta, H, Edwards, SA, (2018). Lifetime consequences of the early physical and social environment for piglets. Advances in Pig Welfare. Lauren completed her PhD in 2009 on the human-animal relationship on caged egg farms, and is currently working at the Animal Welfare Science Centre, University of Melbourne. Her research interests involve using behaviour to assess the welfare of farm animals, particularly chickens, pigs and sheep.